Nearly 1,500 churches participated in “Pulpit Freedom Sunday” this past weekend, an event organized by the conservative Christian Group Alliance Defending Freedom (ADF) in which pastors were encouraged to discuss politics from the pulpit, and even to back a particular candidate. The event has grown steadily over the years, with just 33 pastors taking part in 2008 but more than 1,000 reportedly taking part this year. This annual effort is intended to challenge the IRS regulations that restrict religious leaders from endorsing candidates to their congregations. Participating pastors were encouraged to “preach a biblically based sermon regarding candidates and the election” and to videotape those sermons and send them to the IRS. Under the U.S. tax code, nonprofit organizations such as churches may express views on any issue, but they jeopardize their tax-exempt status if they speak for or against any political candidate. 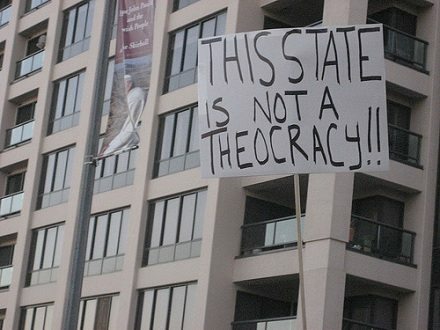 While participants maintain they are standing up for freedom of speech, critics of the movement say that it threatens the constitutional principle of separation of church and state. Americans United for Separation of Church and State (AU) has sent over 60,000 letters to clergy across the country to remind them that federal law prohibits tax-exempt entities, such as houses of worship, from endorsing candidates for public office.